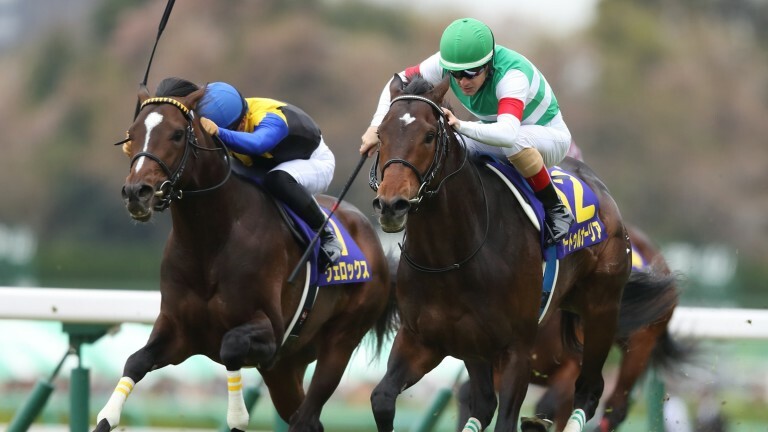 Saturnalia maintained his unbeaten record to justify favouritism and win a thrilling renewal of the Satsuki Sho (Japanese 2,000 Guineas), beating Velox by a head for trainer Katsuhiko Sumii and jockey Christophe Lemaire. Lance Of Puraana and Daddy's Mind led the field early on, with Velox just in behind the leaders. Saturnalia, who won the Group 1 Hopeful Stakes as a juvenile, was settled in midfield after breaking from stall 12. Turning for home, Velox and Yuga Kawada got first run on the favourite, and the pair soon committed for home. However, Lemaire, who was riding Saturnalia for the first time, was wise to the move and improved on the outside, with Danon Kingly challenging strongly on the inside rail. The race soon turned into a battle, with Saturnalia coming out on top by a head and Velox having to settle for second. Danon Kingly was a further nose back in third. Lemaire said: "I rode him for the first time in the race, but I had confidence in him. He seemed a bit nervous and drifted towards the inside when we took command before the crowd. Like Japanese champion and Dubai Turf winner Almond Eye, Saturnalia is by decorated sprinter-miler Lord Kanaloa.